4 cd set compiling the 54 tracks from Apple Venus [Volume One] ✣ Wasp Star [Apple Venus Volume Two] and their respective demo albums Homespun and Homegrown. includes 64 page book of lyrics and notes and downloads of two new songs “Spiral” and “Say It”. 4 cd set compiling the 54 tracks from Apple Venus [Volume One] ✣ Wasp Star [Apple Venus Volume Two] and their respective demo albums Homespun and Homegrown. The set includes a 64 page booklet of lyrics and notes, and a content card enabling download of two new XTC songs (“Spiral” and “Say It”) and a “Stupidly Happy” ringtone. Released on 31 October 2005 in the U.K.
Limited edition pack containing the Apple Box, two Apple Box T-shirts, enamel badge, and a special mystery postcard to be used to claim a free copy of the Apple Bite E.P. Why re-release the Apple Box material now [more than 5 years after the original releases]? It's the only music in 28 years of recording that we've ever owned. We'll never own any of the Virgin catalogue, they have it for perpetuity. But this is the first music that's actually come back to us, it's like our babies have come home. So now's our chance to get it out to people and hope they'll notice it, because when it originally came out there was virtually no promotion. It's a case of second time lucky, hopefully. 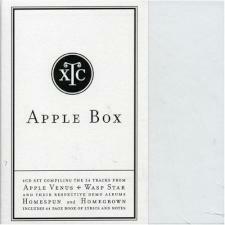 Now with the rights to the Apple Venus albums back with XTC, Idea is proud to announce the release of the much awaited Apple Box on 31st October 2005. The Apple Venus albums were originally intended as a double album, but much to Andy and Colin's frustrations were released as seperate albums. Here, they are united as originally intended, with the bonus of their respective demo albums in a 4 CD set. The box is stunningly simple, pure white, matt laminated with a peacock feather varnished on the box lid. A white matt slipcase completes the look. Inside, each CD is packaged in its own cardboard wallet with new artwork and a 64 page book contains the lyrics to all the songs for the very first time with new liner notes by Andy and Colin. A real treat for all XTC fans is the inclusion of a special content card. Each card contains a unique PIN number which will enable the user to log onto the XTC web site and download for FREE 2 brand new XTC tracks, 'Spiral' and 'Say It'. Also on their mobile phone, with the same PIN they will be able to access, via an SMS text, a FREE XTC 'Stupidly Happy' ringtone. The Apple Set is a LIMITED EDITION pack containing the Apple Box, a set of 2 Apple Box T-shirts and a badge plus a FREE extra item. To claim your extra item return the special Apple Set postcard in the pack and we will send you... ah, now that would be telling, wouldn't it?